Prof.dr. 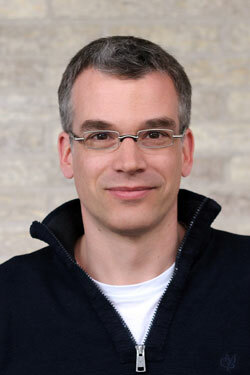 Matthias Heinemann got his Masters (University of Stuttgart) and PhD (RWTH Aachen University) in biochemical engineering. At some point, he realized that he was not so much interested in making things, but rather in how things work. Therefore, during his postdoc (ETH Zurich) he moved closer and closer to biology and at some point “mutated” into a biologist. Since 2009, he is professor of molecular systems biology (University of Groningen), where he aims to contribute to unravel the fascinating biological puzzle – still frequently using the tools of engineers – which often gives us a competitive edge to our research. Our lab currently hosts ten PhD students, three postdocs and a technician. Not only do the lab members come from all over the world (Germany, Greece, Spain, Poland, Brazil, The Netherlands, China, …) they also have very different study backgrounds – from control engineering, via biophysics to biotechnology, and molecular biology, which makes the lab very interdisciplinary. We have a very collaborative and collegial atmosphere in the lab; people help each other with their projects and with their specific expertise. Freedom, responsibility, ambition and mentorship are important key words for us.